The origins of the Hotel are linked with the life of Maria Budziszewska (1872-1942) a well known opera singer. Her stage name was Stamary, which was a combination of her own name and her father’s – Stanisław. At the start of the 20th century she settled in Zakopane and purchased a plot of land on Marszałkowska street (now Kościuszki street) with a view to building a hotel. The design of the building was entrusted to a young architect Eugeniusz Wesołowski (1874-1950) who had moved to Zakopane in 1902. Earlier he had worked as an apprentice to a renowned architect in Lviv – Józef Kajetana Janowski. Here, Wesołowski gained experience, particularly in designing the huge Industrial Museum in Lviv. In 1901, Wesołowski was working for the Okocim brewery. On a trip to Zakopane he met Stanisław Witkiewicz, author of the ‘Zakopane’ architectural style. The highland architecture of the Zakopane Style made a great impression on Wesołowski who considered it a uniquely Polish phenomenon. A decision was made that the Stamary hotel should be an experimental undertaking, utilising the traditional elements of this style used in building wooden houses and translating them in to a large brick building. Apart from the Stamary Hotel, Wesołowski also built the Sokół cinema, the Radowid guest house on Sienkiewicza street and the Dom Ochotnickich (‘Volunteers’ House’) on Kościuszki street. Construction of the hotel began in the Autumn of 1903, although that year only the foundations were laid. The main building materials were brick and stone. The lighter decorative stonework was made from a local dolomite stone but the head stones on the stairs and balustrades were brought in from Nowy Sącz. The bricks were from the town of Żywiec. The carpentry and oak flooring were made by a firm from Kraków – ‘R.Muranyi’. The decorative ironwork was made by Józef Górecki and the stucco work was carried out by J.Szocińki – both craftsmen from Kraków. The central heating was installed by Jeziorański and Drzewiecki from Warsaw and the water installation, bathrooms and sewage were fitted by W.Chylewski of Lviv. During construction, building work was also carried out by monks of the Albertine Order from Kalatówek including Brother Albert (Adam Chmielowski) himself. The cost of the building was one hundred and fifty thousand krone. The modern Hotel Stamary opened in May 1905. At that time it was one of the most luxurious places to stay. Initially there were 35 guest rooms with a dining room and reception rooms. Most of the rooms had private balconies or verandahs and were fitted with double locks. The rooms had separate Summer and Winter ventilation systems and a mechanism to enable the opening of the upper window to a 45° angle. All the corners where walls and floors adjoined were rounded-off to facilitate easier cleaning. The Stamary Hotel also had considerable park land surrounding it, reaching to the bus station. 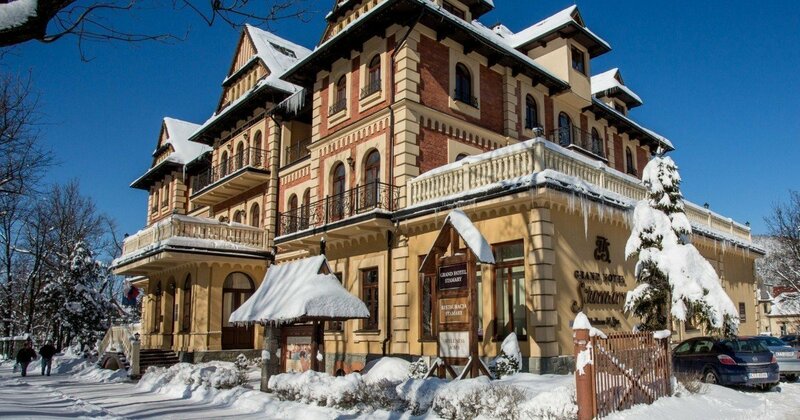 In the early 20th century the hotel was one of the most impressive buildings in Zakopane and quickly became the most renowned accommodation in town. It was a fashionable meeting place for the famous and influential, despite the fact that the first owner was a socialist agitator. Shortly after opening there was a concert presenting the works of Karol Szymanowski. The hotel also organized theatre and dance evenings and many other concerts (including appearances by Budziszewska herself). Famous guests known to have stayed at the Stamary include, amongst others: Ignacy Paderewski (composer), Józef Konrad Korzeniowski (better known as the author – Joseph Conrad), Ignacy Daszyński (journalist, politician, Prime Minister and President of the Provisional Government of the Polish Republic in 1918), Wojciech Kossak (painter, particularly of battle scenes, including the huge Racławice Panorama now displayed in Wrocław) and Maria Pawlikowska-Jasnorzewska (Polish poet known as the "queen of lyrical poetry" and daughter of Wojciech Kossak). Maria Budziszewska also carried out various charitable works. The Stamary Hotel housed a soup kitchen for the unemployed and she also gave financial support to the Society of University Workers and to the newspaper, ‘The Zakopane Echo’. In 1912, Budziszewska founded an association of hoteliers and restauranteurs in Zakopane. In the same year, the Hotel introduced electric lighting, powered by its own petrol driven generator. This was the next in a line of improvements to the Hotel; earlier, in 1910, a garden cafeteria had been added. In 1914, the Hotel housed a recruiting centre for candidates to the Zakopane Rifle Regiment – and it was from outside the Stamary that 480 riflemen started out on 5th August 1914 to enter active service with the Polish Legions. The organizers of this campaign were Andrzej (later General) Galica and Mariusz Zaruski. The outbreak of the First World War also meant stagnation of the economy, which was felt by the owner of the Stamary. The whole hotel industry suffered from the scarcity of provisions and Budziszewska was forced to take out loans to keep the hotel functioning. Despite the financial difficulties, the Stamary was extended several times and new rooms were given to returning legionnaires by the owner. At around this time Józef Piłsudski also stayed at the hotel. Maria Budziszewska was also having problems connected with her affiliation to the Socialist Party. The local population wanted her out of Zakopane and the local council coveted her property. At this time the ‘Wydział Krajowy’ (a government administrative body) was relocated to Zakopane where Budziszewska was forced to rent the hotel building for 30 thousand krone. The building was emptied and the guests were forced to leave. When this institution moved to another building, the hotel was requisitioned by the Austrian army, leaving Budziszewska with no income for one and a half years. Furthermore, local government officials were threatening her with compulsory emigration and accusing her of being sympathetic to Russia. She was saved by her Austrian passport which she had held since before her arrival in Zakopane. Shortly after this, the President of the Polish Red Cross decided to take over the hotel to turn it in to a hospital. Budziszewska was offered seven thousand krone annual rent and it was proposed to remove 45 toilets from the building. She adamantly refused. This refusal, however, put her in danger of expulsion from Zakopane. She turned to Vienna for help and the requisition was overturned. A change in the ruling powers also brought renewed determination to outlaw socialist organizations. The local council was inundated with false accusations against Budziszewska, primarily from the local Highland people and others with an interest in the opera singer’s wealth. Finally in 1919, a local by-law was passed taking the Stamary Hotel “as punishment” and giving over part of the building to the army. Once again a requisition order was in place. The first and second floors were left to be used by guests, but there was a common entrance to the hotel and no kitchen, meaning that breakfasts could not be served. A Worker’s Union stood in defense of the Hotel. Knowing that, by law, a permanently occupied residence could not be requisitioned, two families moved in to an empty wing of the Hotel at night, making it their permanent home. The requisition committee had no choice but to back down and return the ground floor to the Hotel. Only a small extension was taken for army use. At the start of the Polish-Bolshevik war the requisition order was removed. Budziszewska wanted to include the working class and incorporate them as partial owners of the hotel – thus fulfilling her personal philosophy and educational and business goals. As well as rooms for workers, Budziszewska also installed kitchens, paying from her own pocket. Workmen converted some of the bathrooms in to reading rooms and a lecture theatre. Her initial conception also included the building of a separate workers’ house, but disillusionment with the socialist party drained Budziszewska’s enthusiasm for the project. Throughout the 1920s, the local government continued its efforts to part Ms Budziszewska and her wealth. Once again she was accused of being unpatriotic. There was a suggestion that the Stamary Hotel should be converted in to a ‘health farm’ in line with Zakopane’s growing reputation as a Spa town and the owner would be paid a life-long rent. Again Budziszewska refused the council’s ‘suggestion’, and, as a result, efforts to ruin her both socially and financially were stepped up. The Hotel was reduced to a ‘category II’ hotel following an incident when a blocked filter caused the hotel cellars to be flooded with a few centimetres of water. The owner received a hefty fine and was forced to rent rooms only without providing meals. The local council in Zakopane decided that the hotel should be converted in to a prison. Budziszewska appealed for help to the Starost (historically a local nobleman with limited administrative powers) a Mr.Trześniowski. Thanks to him, the hotel was finally given as a meeting house to the Tatra Social Club. Shortly after, an organization promoting Zakopane as a Spa town took over the Stamary for a period of 10 years and reaped all the consequential financial benefits. Budziszewska was left with just two rooms. To pay her financial obligations, she took out further loans. Soon her debts were in the tens of thousands of złotys. Yet despite these difficulties, she continued the expansion of the hotel which she had started before the War. Administration costs had increased and very few guests came to stay at the ‘health farm’. To cut costs, the local council cut-off the water supply to the Stamary, allowing water for only two hours per day; despite the fact that all other hotels and pensions had a plentiful supply. In 1929, Budziszewska’s entire estate was finally taken by the nation, even though the value of the Stamary was more than five times greater than the debt she owed. In 1931 a board of administrators was established to control the Hotel. Budziszewska tried to raise funds by extending a swimming pool and restaurant complex in Jaszczurówka which she leased with her business partner Włodzimierz Berberyusz. That venture failed to provide income, and the Stamary Hotel was put up for auction. The town council purchased the Hotel for 1100 dollars and a Dr.Bahr was installed as the new owner. After 1935, the owner turned the Hotel over to a national bank. Maria Budziszewska was given lifelong use of one room on condition that she never spoke to the Hotel staff. In 1939 at the outbreak of World War II, German soldiers of the Wehrmacht occupied the Hotel. It is not known whether Budziszewska continued to live in the Hotel or what happened to her in the ensuing three years. It is known only that she died alone in 1942. She was buried in the new cemetary, but the location of her grave is unknown. At the start of the German occupation, the Stamary Hotel was used for training Ukrainian soldiers to form an SS-Galizien corp to fight alongside Hitler’s troops. They were trained in creating diversions, sabotage, Gestapo interrogation methods and various methods of killing. This training school was run by Hauptmann Krüger and lecturers on the course included Mykoła Łebek and Mykoła Arsenycz. The building also housed the area commandant, the so-called Standortkommandantur. Aside from the town commander the military police (Feldgendarmerie) were also billeted in the hotel, and could be seen patrolling the streets of Zakopane with their distinctive half-moon, metal breast plates. The Stamary was also the site of another wartime incident when a German fighter plane had to make an emergency landing in the Hotel grounds in 1944. After the War, the National Enterprise Bank converted the Stamary in to a guest house for its employees. From 1948 the building belonged to the FWP (Employees Holiday Fund) who named the hotel ‘Przodownik’. The FWP began to extend the building further, also altering the facade. The work took place under the watchful eye of the Heritage Conservation Committee. Also observing the building work was the architect, Eugeniusz Wesołowski, who fought to keep the original conception of the Stamary. To this end he personally delivered a letter to the then Director of the Tatra Museum – Juliusz Zborowski – defending his design. He argued that the Stamary was a valuable example of a distinctive national architectural style, which should be preserved. Until 1957 the building housed local administrative offices and that year was renamed once again, as ‘Podhale’. At this time, building also began in the grounds and parkland surrounding the hotel. In 1958, a piece of land adjoining the nearest street – Chramcówki – was designated for PKS, the Polish bus and coach service. In 1960, on the remaining land, work began on a large guest house for workers in the rail industry. The FWP were forced to sell the Podhale in 2002 because of financial difficulties. A huge rebuilding and restoration project took place and the building was returned to its original purpose and name, opening as a new four star hotel in 2006. Thanks to the present owners, the Grand Hotel Stamary retained its magnificent architectural form and stylish interiors. Once again it is one of the most esteemed and luxurious hotels in the area. Since 11th June 2008, the Grand Hotel Stamary has also housed the Honorary Consulate of Slovakia. Maria Budziszewska was an animal lover. According to some sources she may have had up to 30 fox terriers. The original design had the building facing the Bystra stream. However the building commission demanded it be rotated through 90° to face what was then Marszałkowska street. The building was never approved by Stanisław Witkiewicz as an example of the ‘Zakopane Style’. He was never known to have even commented on the project. In the Hotel gardens there was to have stood an altar dedicated to St. Anthony. The design was also by Eugeniusz Wesołowski, but the project never came to fruition. In 1908, Wesołowski designed a tower as an extension to the Stamary, but this was also never built. The architect Eugeniusz Wesołowski was a talented amateur actor who appeared regularly on the stage after 1903. Maria Budziszewska was friendly with the painter Wojciech Kossak and built a wooden workshop for him next to the Marilor villa. The workshop was designed by Tadeusz Stryjeński. Although the hotel opened in May of 1905, guests had already been staying there in April. Eugeniusz Wesołowski sent the plans for the Stamary to a large exhibition of the Podhale region in Lviv. He was very proud of this particular project and he used the fact that he designed the Stamary when advertising his services. In August of 1922, the first ever Zakopane championship tennis tournament was held on the Stamary tennis courts. Before WWII, a Russian Orthodox altar could be found in the Hotel.